With Black Friday on the horizon, holiday shopping season is about to amp up, and Aphex Twin is getting into the spirit with a new line of merch. He's unveiled a series of gift-able horrors that include teddy bears, umbrellas, masks and baby onesies. 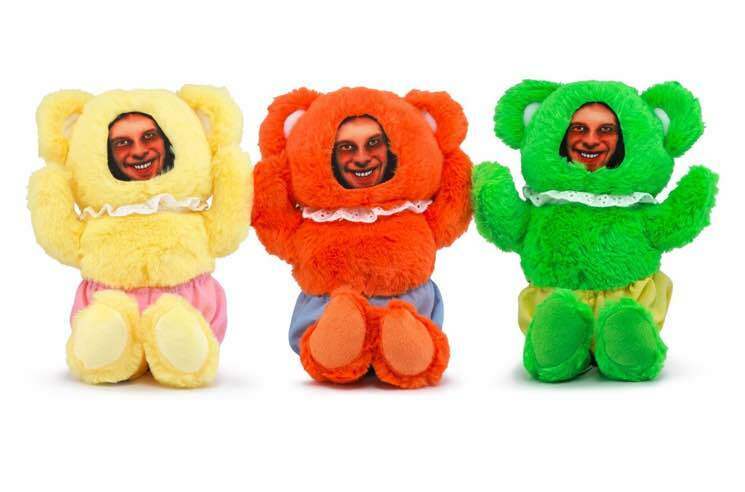 The colourful plush bears are especially spooky, wearing nothing but frilly collars and bloomers, with a creepy distorted image photo of Richard D. James' face embedded in their heads. The baby onesie, meanwhile, is creepily emblazoned with the caption: "Aphex Twin. Come to Daddy. Retail item." If you don't want to give your Secret Santa nightmares, though, you could opt for an Aphex Twin-branded umbrella, towel, hoodie or a copy of recent EP Collapse. See some of the options below, and head over here to sign up to get your hands on the bizarre merch collection when it goes on sale Saturday (November 24).